An interview with historian Josef Foschepoth published in the online edition of the Süddeutsche Zeitung makes clear that US intelligence agencies have a free hand to do what they like in Germany, with the knowledge and blessing of the federal government. Foschepoth is professor of history at the University of Freiburg, and an expert on the role of Allied intelligence in postwar Germany. In 2012, he published a book on the subject entitled, “Germany Surveilled”. The historian regards the indignant response of the German government regarding the spying activities of American and British intelligence services unmasked by Edward Snowden as pure hypocrisy. For a Western intelligence agency, such as the National Security Agency (NSA), there are in principle no limits in Germany. According to Foschepoth, the legal basis for the activity of Western intelligence services in Germany goes back to 1963. At that time, Germany and the Allied nations committed to close collaboration in the collection, exchange and protection of intelligence in a supplementary agreement to the NATO Status of Forces Agreement. The agreement came about through secret negotiations and was strictly confidential. “US intelligence agents go in and out in Berlin, Cologne and Pullach, where the German domestic and foreign intelligence agencies reside,” writes theSüddeutsche. The newspaper supposes that the reverse is also the case, indicating that there is a lively exchange between the country’s intelligence agencies. In the government, it has mainly been Sabine Leutheusser-Schnarrenberger, who has long-served as a liberal fig leaf for the Free Democratic Party’s (FDP) right-wing policies, who expressed public outrage over the NSA bugging. However, as Minister of Justice she must have known about the public and secret agreements that allow the NSA to spy unmolested in Germany. In a guest contribution for the Frankfurter Allgemeine Zeitung, SPD chair Sigmar Gabriel expressed outrage over the “betrayal of our core values” and called for a struggle against “data capitalism”. In fact, it was his party colleague, Otto Schily, who as Interior Minister in the Schröder government, massively strengthened the intelligence and security apparatus, and proclaimed a “basic right to security” that does not exist in the constitution. While Leutheusser-Schnarrenberger pretends to know nothing and Gabriel spouts radical phrases, others are trying to steer indignation about the NSA’s espionage along nationalist lines. The most open in this regard is Jakob Augstein’s regular column in Spiegel Online, which is cynically titled “When in doubt, [turn] left”. 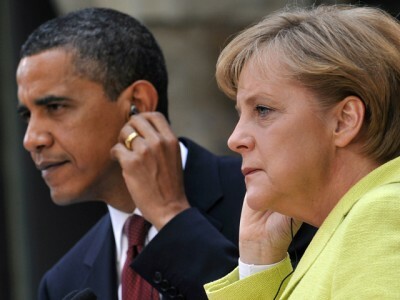 The response to excessive intelligence snooping is: strengthen the power of the German state! Given the traditions of the Prussian authoritarian state, Nazi dictatorship and the subsequent integration of its staff into the West German judiciary and intelligence service, only a narrow-minded journalist with historical amnesia such as Augstein could come up with such an idea. In fact, the target of the NSA wiretaps and the German secret services, which work together very closely, are their own people. The only “counter-power” that can oppose them is the working class on both sides of the Atlantic.